The Baltimore Colts were heavy underdogs as they hosted the Chicago Bears in their season-opening game on September 25, 1955. Coming off of a 3-9 record in Head Coach Weeb Ewbank’s first season, the team had 12 rookies on the roster, most notably FB Alan “the Horse” Ameche, the Heisman Trophy winner out of Wisconsin, and QB George Shaw, the bonus first draft pick out of Oregon. The defense featured established players in DE Gino Marchetti, DT Art Donovan, DE Don Joyce, and safety Bert Rechichar, who also handled the placekicking. However, the Colts were without injured star HB Buddy Young. Chicago was coming off of an 8-4 record in 1954 but there was an extra element at play. Owner George Halas had already indicated that his thirtieth year doubling as head coach would be his last, and there was a sense of urgency to send him out with one last NFL title. There were 36,167 fans in attendance at Memorial Stadium and the home crowd saw the Colts start off in stunning fashion. On the second play from scrimmage, Alan Ameche carried the ball for the first time and charged down the left sideline for a 79-yard touchdown. Bert Rechichar added the extra point. Midway through the first quarter the Colts scored again when Rechichar kicked a 23-yard field goal and the home team led by 10-0. Early in the second quarter, it was George Shaw spurring a Baltimore drive, completing all three of his passes as the club advanced 67 yards. Two of them were to end Lloyd Colteryahn, for a gain of 15 yards and, two plays later, for an 11-yard TD. Rechichar again converted to put the Colts up by 17-0. The Bears finally got on the board with four minutes remaining in the first half when QB George Blanda threw to end Harlon Hill for a touchdown from 10 yards out, completing a 65-yard drive, and Blanda also booted the point after. But Rechichar’s long kickoff return set up his second field goal from 43 yards five plays later and the halftime score was 20-7. In the third quarter, a pass interference penalty on the Colts gave Chicago a first down at the Baltimore three. From there, HB Bob Watkins ran around left end for a TD and, with Blanda’s conversion, the Baltimore lead was narrowed to 20-14. However, just before the end of the period, the Colts were able to get into scoring territory and came away with a third field goal by Rechichar, this time from 10 yards. The Bears missed opportunities in the fourth quarter. Blanda failed on a 37-yard field goal attempt and Rechichar came up with a key interception at his 12 yard line to thwart another potential Chicago scoring threat. In one other foray into Baltimore territory, the Colts sacked Blanda on consecutive plays, but he followed up with a 49-yard field goal that again made it a six-point game. In the final seconds, the desperate Bears resorted to a trick play from their own 19 as end Bill McColl threw to Hill, who gained 59 yards to the Baltimore 22, but the clock ran out on the visitors at that point. The Colts pulled off the upset by a final score of 23-17. Chicago, playing from behind from the start, led in total yards (361 to 306) and first downs (23 to 14). However, the Bears also turned the ball over four times, to one by Baltimore, and the Colts did well keeping the ball on the ground, gaining 226 yards on 45 running plays. Prior to Bill McColl’s long pass play at the end, Chicago’s quarterback combination of George Blanda and Ed Brown accounted for 227 yards on 20 completions with a touchdown and two interceptions. But the Colts sacked Chicago quarterbacks five times for losses totaling 47 yards while suffering only two in return. Alan Ameche rushed for 194 yards on 21 carries that included the long touchdown and George Shaw completed 7 of 12 passes for 97 yards and a TD with no interceptions. For the Bears, Harlon Hill had 5 catches for 107 yards and a TD in a losing cause. Baltimore’s win was the first of three straight to open the season, but the Colts were badly beaten in the second meeting with the Bears and had only two more victories the rest of the way. They finished fourth in the Western Conference with a 5-6-1 record. Chicago took an opposite course, losing its first three contests before the victory in the return engagement with the Colts spurred a six-game winning streak. However, an upset loss to the cross-town Cardinals derailed the Bears at that point and, while winning their two remaining games, they ended up second in the conference at 8-4, just behind the Rams, who were 8-3-1. 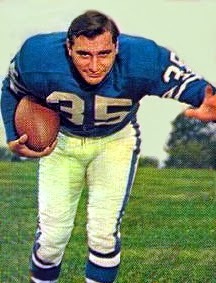 Alan Ameche led the NFL in rushing with 961 yards on 213 carries (4.5 avg.) and scored nine touchdowns. He received consensus first-team All-NFL honors as well as Rookie of the Year recognition from UPI and The Sporting News, and was selected to the first of four consecutive Pro Bowls. His 194-yard single-game performance against the Bears remained the franchise record until 1971. Beyond Ameche and George Shaw, other rookies began to emerge from among Baltimore’s first-year crop, such as HB L.G. Dupre and end Raymond Berry, and they would eventually become part of the team that won back-to-back titles in 1958 and ’59. As a further footnote, George Halas’ retirement, which was always more of a formality than a reality, lasted for two years before he returned to the sideline in 1958. He finally retired for good following the 1967 season, his fortieth.